October 4th is celebrated as National Taco Day but you can celebrate with tacos at any time of year. If you're planning a Mexican Fiesta to honor the the bride-to-be and her groom, you're going to love these fun Tacos and Tequila Couples Shower invitations. Click on your favorites to learn more and to order yours today! All of these gorgeous invites have been brought to you from Zazzle, a world leader in personalized paper goods, apparel, and gift items. 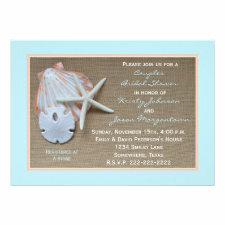 Each invitation comes complete with a standard white envelope suitable for mailing. Visit Zazzle to see all of the Taco-inspired invitations. Or visit the following links for some fun taco facts and recipes. Taco Recipes from the Today Show. If you're looking for the easiest way out to hosting a truly memorable bridal shower, think cute little cupcakes served along with her favorite cocktails and you've got one sweet shower idea. Truly, who doesn't love a cupcake? I don't know anyone in that category and if you do, dump them fast. You certainly don't need that kind of negativity in your life. To host a cupcakes and cocktails bridal shower the first thing you're going to need are some fun invitations that state your intentions. specifically for your cupcakes and cocktails party event. The cupcakes and cocktails theme is something you can really get creative with. To help you get those imaginative ideas flowing you might like to visit this board at Pinterest that I created and filled with fabulous cupcakes and cocktails. Many of the pins there contain recipes too. You're going to want to be sure to have some non-alcoholic drinks available for those who don't imbibe and for the designated drivers at the event. Keep the cocktail list small by serving a punch or two. 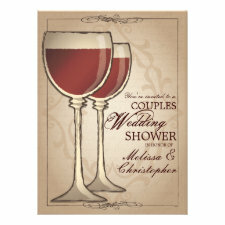 Or choose something to be the bride's signature drink and only serve those along with some wine. You want to have fun without getting anyone totally smashed. Decide early on for a color or flavor theme. You can use treats and drinks that only match the bride's color scheme, or not. Where does her taste lead? Is she a coffee lover? Or perhaps she likes all things fruity? Are you going to serve super sweet cupcakes or maybe just the more grown-up kind? There's tons of little sweets and tasty drink mixes to match just about anyone's favorite flavor. Think about setting up a cupcake bar where you supply the already baked unfrosted goodies and let your guests decorate their own masterpieces. You could even have a contest to see who makes the best - worst one. To make it even easier on yourself, have guests bring along their favorite cupcakes homemade or store bought, to share with the group. It's easy to just serve the sweets but a few appetizers might go a long way towards filling up the folks in attendance. And yes, cake pops and mini anything are welcome! Coffee at the end of the night would be a GOOD idea. Keep the decorations simple and you've got yourself an unforgettable shower theme that's easy to set up and super affordable for the people throwing the party. And do PLEASE drink responsibly. This party is intended for grown ups only. Keep the kiddies away and keep a watchful eye on your guests. Don't let anyone leave or drive drunk... EVER. Instructional video for baking and decorating regular cupcakes in cocktail glasses. These would be really cute at the shower. If you're looking for ideas for a small bridal shower, how about having a group cooking class? This is perfect for those who love to cook or for a bride who is inexperienced in the kitchen. Think about all of those holiday meals that were cooked in grandma's kitchen with all of the aunts and uncles and cousins pitching in. Weren't they fun? By choosing a cooking class shower theme, you can easily recreate that atmosphere for the bride-to-be's special day. 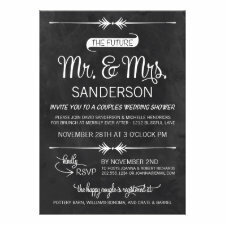 This idea is so unique that I wasn't able to find specific invitations for it but the featured invite can be easily customized to suit your needs. There's a couple of different ways you can plan this type of shower. First, you'll need to decide if this is going to be for couples or just the girls. Keep in mind that it's probably better to do this with a smaller group but, couples showers are getting very popular lately and including the guys can be a lot of fun. Besides, some of the best chefs are men aren't they? So, why not? The cooking shower can be held at someone's home if you have an experienced cook who's willing to take the lead and who also has enough cooking utensils and space in her kitchen. This can be a fun way for the mothers-in-law on both sides to share their child's favorite recipe with the new members of the family. One mom can teach a main dish while the other mom makes a special dessert. There are also quite a few places that offer professional cooking classes that can be found through a search in your local area. That way everyone can learn a new cooking style or technique. Another alternative is to hire a professional chef to teach the "class". The best part of this type of shower is that once the meal is done, everyone gets to sit down and enjoy something they made as a group. If you're having the shower at home, you can plan a few silly games and the losers get to clean the kitchen afterwards. Click the image of this Retro Bridal Shower cookbook recipe binder to learn more. Choose a special cooking theme for the event such as Italian or Chinese food, or even something sweet like savory ans sweet pies or Death by Chocolate. Keep the kitchen theme going by asking guests to bring kitchen items and cooking supplies as gifts for the couple-to-be. And be sure to ask each guest to bring a copy of their own family favorite recipe for the new couple to enjoy as they make their lives together as husband and wife. I found a page full of cooking themed bridal shower ideas at Martha Stewart's site. You can see them by visiting HERE and there's an entire Pinterest board devoted to the subject HERE where you'll find more great ideas. by Salicia (CC BY-ND 2.0) via flickr Click on the image to see the original. As always, we invite you to share your own good ideas in the comments below. We love hearing from our readers.